You’ll never hear anyone say that a car is a great investment. You’re more likely to hear how cars lose half their value when you drive them off the lot. Because of this, most people treat their car as a necessary expense that helps them get to work, unless of course you’re an Uber driver, which you’ve probably contemplated given how much money you’ve spent on them lately. On the other hand, people refer to home purchases as “the biggest investment you’ll ever make.” But is that thinking based on recent trends or historical return? What separates a car from a home and an expense from an investment? An investment is a capital outlay that produces some positive return net of inflation. The inflation piece is important. If your investment does not produce value in excess of price increases, then you are no better off having invested, because your wealth relative to the price of the things you buy with it has not changed. 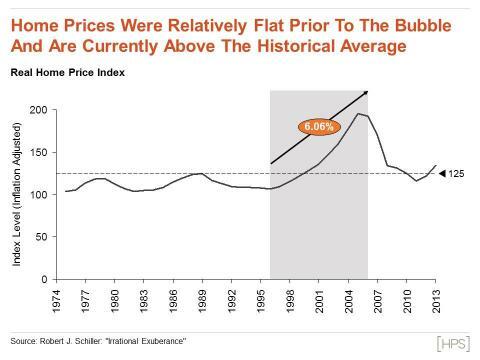 According to data produced by Robert Schiller, the inflation adjusted price of homes between 1975 and 1996 grew by a compound annual growth rate (CAGR) of 0.15 percent. This means that without taking into account any other factors, homes were a poor investment during this time period. By contrast, the S&P 500 grew at a CAGR around 5.2 percent over the same time period. Then came the bubble. The home price CAGR shot up over 6 percent between 1996 and 2006 – bucking the 20 year trend. During this period, it would appear that a home was a good investment, but it wouldn’t have been a bubble if this didn’t reverse in a big way. Watching home prices like we do the S&P or GDP and hoping for growth is dangerous and indicative of the mentality that created the housing bubble in the first place. It may lead to further speculation and a return to unsustainable bubble-era price growth and volatility. For the average buyer, a home is more expense than investment and should be treated as such.